Welcome to the www.assignmentsabroadtimes.com website. 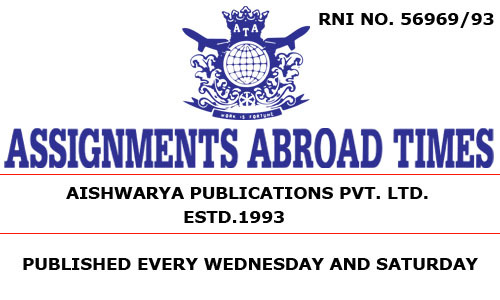 These are the terms and conditions (Terms) which govern your use of (1) the www.assignmentsabroadtimes.com website and (2) any of the apps available for use on a Mobile Device (Site). For the purpose of these Terms “Mobile Device” includes a Smartfone or other mobile or handheld device (such as a tablet) with an open operating system capable of exchanging data via 2G, 3G, 4G or wirelessly over a computer network (for example Apple OS iPhones, iPads, Kindle, Kindle Fire, Android OS phones tablets and Symbian OS phones and tablet devices). The Site is operated by or on behalf of Aishwarya Publications Private Limited ("APPL", "we" or "our"). We are a company registered in Mumbai with theRegistrar of Companies,Bombay, India. Our registered office address is 301, 3rd Floor, Eruchshaw Building, 249 Dr. D N Road, Fort, Mumbai – 400001, India. You can contact us by telephone on the Telegraph General Switchboard at +91-22-25290304. At any time without notice and in our absolute discretion, we may permanently or temporarily terminate, suspend or deny your access to the Site. At any time without notice and in our absolute discretion, we may remove or edit any Content on the Site. To the fullest extent permitted by law, in both cases none of APPL, its directors, employees or other representatives have any liability to you whatsoever for any loss or damage arising from such removal or editing or any restriction or hindrance to your use of the Site, email services or password. Is not obscene, threatening, menacing, offensive, defamatory, abusive, in breach of confidence, in breach of any intellectual property right (including, without limitation, copyright) or otherwise in breach of or violates any applicable law or regulation or code, and you shall indemnify us and keep us fully indemnified against any third party liabilities, claims, costs, loss or damage we incur as a result of publishing material you submit to us, including consequential losses. We have no contractual liability to you in respect of the goods or services provided by the third party supplier. For more information about placing advertising or sponsorship on the Site please contact our marketing department. Assignmentsabroadtimes.com contains contextual affiliate links from which we may potential earn revenue. However, the content of our articles are never influenced by advertisers or an affiliate, nor are they written for the purpose of promoting a product. Neither APPL nor any of its data providers or affiliates gives any warranty or guarantee relating to availability of the Site or that the Site and/or our operation of it, the Content or the server that makes the Site available are error or virus free or free of other harmful components or that your use of the Site and/or the Content will be uninterrupted. Any contractual or legal relationship between you and APPL will be concluded in English. All notices shall be given by e-mail to us at appl@gmail.com or, to you at either the e-mail or postal address you provide during the registration process (if any). Notice will be deemed received 24 hours after e-mail is sent or 3 days after the date of posting. These Terms form the entire agreement between the parties concerning your access to, browsing and/or use of the Site and supersede all prior agreements, arrangements, understandings and representations made between us (whether written or oral) concerning the Site. No waiver by APPL of any breach of these Terms shall constitute a waiver of any other prior or subsequent breach and APPL shall not be affected by any delay, failure or omission to enforce or express forbearance granted in respect of any of your obligations. The rights and remedies of APPL under these Terms are independent, cumulative and without prejudice to its rights under the law. These Terms are not intended to create and shall not create any rights, entitlements, claims or benefits enforceable by any third party by virtue of the Indian Contracts Act 1872. These Terms and/or your use of the Site shall be governed by and construed in accordance with Indian law and the Courts in Mumbai shall have exclusive jurisdiction over any dispute which may arise.